Please note that the links below are affiliate links, and at no additional cost to you, I will earn a commission if you decide to make a purchase after clicking through the link. Please understand that I have experienced all of these companies, and I recommend them because they are helpful and useful, not because of the small commissions I make if you decide to buy something through my links. Please do not spend any money on these products unless you feel you need them or that they will help you achieve your goals. The number one question I get asked the most is what kind of pens do i use & recommend. While the tools don't make the artist, I do have some suggestions for when you're deciding amongst the plethora of overwhelming pens out there. If you're an aspiring lettering and calligraphy artist and you're just starting out, a finer tip brush is definitely the way to go. The more inflexible the brush, the more resistance there is between the pen and the paper which allows for better pen control. Ahhh, the Pip-Squeaks. Much like its older (and bigger) sibling—the Crayola Broad Line—the Pip-Squeaks create similar weight distributions, but with smaller proportions. The nib is a little firmer than the classic Crayola, but the barrel is shorter, making it a difficult to hold. If you are trying to acheive a smaller size and want that classic Crayola touch, the Pip-Squeaks are a perfect solution. The Crayola Gel markers are a fun way to experiment on darker colored paper. Their colors are opaque and vibrant creating unique effects depending on the substrate. Some colors work better than others and they do tend to dry out fairly quickly. Don't give up on them too soon because a little water on the tip of the markers can bring them back to life. The Crayloa Fabric Marker, while specifically made for cotton or polyester garments, is very similar to the above Gel Marker in that it creates bright colors, but also falls a little short with it's lifespan when using paper as a surface. It's still a fun marker to experiment with and I recommend, at the very least, trying them out. A great beginner pen and the name holds true; it's small enough to fit in your pocket. 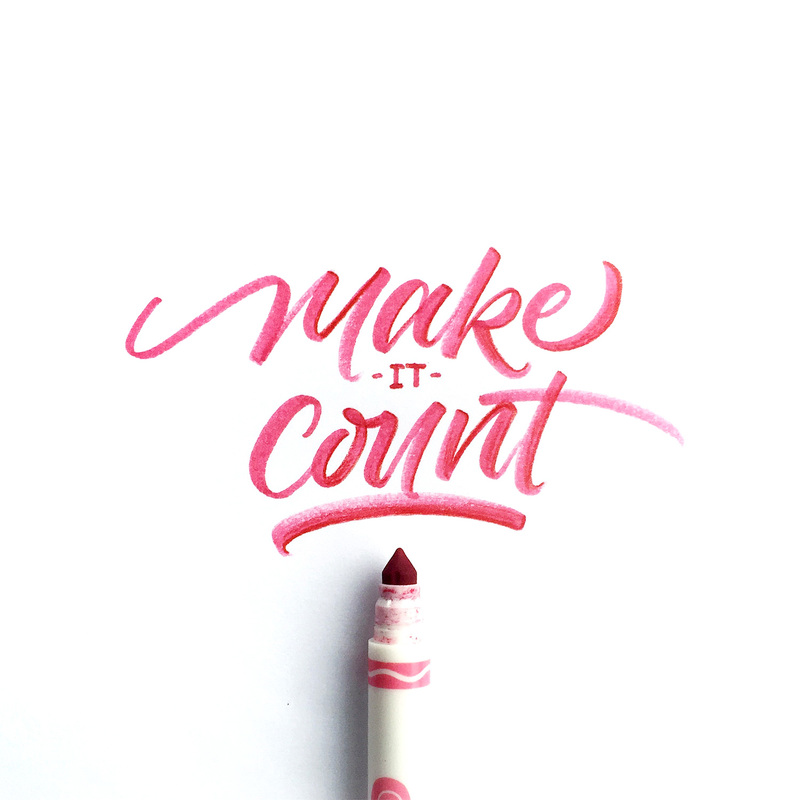 The hard felt tip is great for beginner calligraphers because it allows for just enough give to create smooth transitions while maintaining it's shape. A great beginner pen and the name holds true—it's small enough to fit in your pocket. Quite possibly my favorite brush pen, the fine Zebra Disposable has a unique tip that remains flexible, but isn't intimidating because it holds it's firmness throughout each stroke. The ink dries on your paper relatively fast and they last for awhile. When the pen begins to run out of ink, Zebra Disposables create some really interesting textures to your work. I highly recommend trying this one out. If you're comfortable with the majority of pens I mentioned above, or similar brushes that are smaller and overall firm, then you're probably ready to begin experimenting with slightly softer brushes. The following pens have tips I recommend and use quite frequently myself. Even if you are a beginner, it won't hurt to try a few of these softer pens so that you are able to feel the difference and compare the two different kinds of brushes.